running out of patience. The 16th century King meets a 21st Century audience. Heads will roll. This new show from a multi-award-winning team was a sell out with added dates at Brighton Fringe and won a standing ovation for every performance at Kansas City International Theatre Festival. The highly flexible staging means it can fit in any space and is ideally suited to rural touring. Written by Ross Gurney-Randall and Pete Howells. 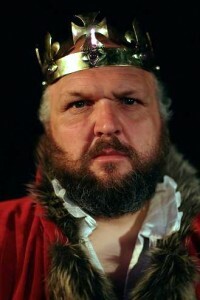 With Ross Gurney-Randall* as Henry VIII. Directed by Tony Haase.